CAPECANAVERAL, Fla. ? Space shuttle Discovery rolled out from its hangar?forthe last time early Thursday at NASA's Kennedy Space Center in Florida,beginning the first leg of its final mission into space. 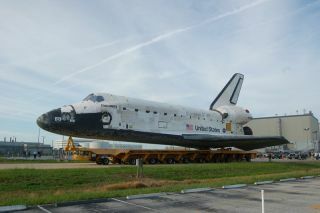 Thewinged orbiter, the oldest of NASA's space shuttle fleet, emerged from itsmaintenance hangar at 6:30 a.m. EDT (1030 GMT) on its way to the nearby VehicleAssembly Building. A water main break at the Florida spaceport on Wednesdayforced NASA to delay the shuttle move by one day. Onceinside the cavernous 52-story building, Discovery will be attached to the twinsolid rocket boosters and external fuel tank that will help launch it to theInternational Space Station on Nov. 1. Discovery'supcoming STS-133 mission will mark the shuttle's 39th flight to space and NASA's133rd shuttle flight since the fleet began space launches in 1981. It is NASA?ssecond-to-last space shuttle mission before the fleet retires next year. ? Theshuttle Endeavour?s STS-134 mission in late February 2011 is scheduled to be thefinal flight, though an extra mission on the orbiter Atlantis is underconsideration. NASA is retiring its shuttle fleet to make way for a new plan tosend astronauts to visit an asteroid by 2025. Discovery'sfinal spaceflight will deliver a storage room for the International SpaceStation and a humanoid robot assistant for the outpost's astronaut crew. Butfirst, the shuttle had to leave its hangar to meet its fuel tank and rocketboosters. Thursday?squarter-mile trip between its maintenance hangar and Vehicle Assembly Building wasthe 41st rollover in 26 years for Discovery, also known by its orbiterdesignation OV-103. Discoveryhas more rollovers than actual space missions because the shuttle had to repeatthe trip on two occasions: once for its maiden flight, STS-41D, in 1984 andagain in 1991 before the STS-39 mission. In both cases, the re-rollover was dueto Discovery needing repair before it could fly. Thursday'sjourney was made atop the same 36-wheeled transport trailer that has movedDiscovery ? and all of NASA?s orbiters ? before each mission. Thislatest rollover was originally planned for Wednesday morning but was delayed aday due to a water main break that forced NASA to close the space center to allbut essential personnel. The burst 24-inch pipe, which was located nearby in ?theVAB, was promptly addressed, allowing center operations to resume and therollover to proceed this morning. Thetrip between a shuttle hangar and the Vehicle Assembly Building typically takes about a half-hour to complete, but NASA parked Discovery outside its hangar for several hours to allow its employees ? those who worked on the shuttle ? topose with spacecraft for one last set of photos. Once mated to its boosters and fuel tank ? an hours-long procedure assisted by a crane that is expected to be completed Friday morning ? Discovery will embark on a different type of roll. The completely assembled shuttle stack will ride a massive Apollo-era crawler transporter to the 3.4-mile (5.4-km) trip to Launch Pad 39A. At the pad, Discovery will be readied for its November launch and loaded with its payload. The launch pad rollout for Discovery is scheduled to begin late Monday, Sept. 20.